Sein Stil ist unverkennbar, und wer je sein Posaunensolo gehört hat, wird es nicht mehr vergessen. Während mehr als dreissig Jahren seit seinem ersten Soloauftritt und mehr als zwanzig Jahre seit seiner ersten Solo-Platte hat Conrad Bauer das Spiel der unbegleiteten Posaune erkundet. «Hummelsummen» zeigt Conrad Bauer auf der Höhe seines Könnens. Conrad Bauers Spiel ist sowohl «technisch als auch historisch detailliert Ð es umfasst einerseits das weite Spektrum von Techniken,die dem zeitgenössischen Posaunisten zugänglich sind, zeigt aber auchdas Netz von Genres, in denen das Instrument eingebettet ist: da sind der Marsch, die Parade, der Zirkus, die Anfänge des Jazz, Bebop, freie Improvisation, Neue Musik, sogar anverwandte Traditionen wie Alphorn- oder Jagdhorn-Rufe», schreibt der Chicagoer Jazzkritiker John Corbett über den Posaunisten und kommt zum Urteil: «Eine der radikalsten originalen Stimmen in der improvisierten Musik». For nearly thirty years, since his first solo performance in 1974, German trombonist Conrad Bauer has been intensely exploring the inner logic on unaccompanied trombone, as an adjunct to his group activities. And for more than twenty years, since the releases of his first solo records, Bauer has offered his exploded view of the solo trombone to the world at large. His perspective is exploded both technically and historically - one that encompasses the wide range of techniques available to the contem porary trombonist, as well as the web of genres in which the instrument is imbricated, including march, parade, circus, early jazz, bop, free improvisation, new music, even other related traditions like alphorn and bugle call. Think of these all as sharpnel, shards of earlier identities, once relatively exclusive, that have been blown apart and currently float around each other, equally available to the sensitive musician. Add to them a repertoire of individual Conrad-isms (the high-squeak/lip-flutter combination at the 2 minute mark of the opening track, for example, is characteristically Conrad), moves nobody else makes, and you have one of the most fiercely original voices in improvised music. When you have worked as fiendishly hard and experimented as exhaustively as this Bauer has to come up with a unique vocabulary, it's a challenge - perhaps the challenge - not to make individual techniques into a fetish. 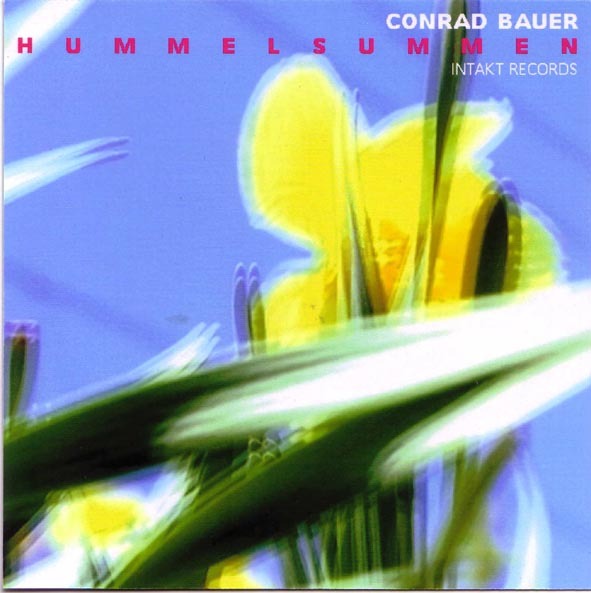 On Hummelsummen, Bauer's fifth solo record, he overcomes this temptation by concentrating on the storyline of each piece, subjugating the technical to the narrative, so that the arc of each track creates the frame for everything that happens within it … A celebration of sixty years on earth (2003), three decades exploring solo trombone. Conny Bauer: fancymonger, storyteller, busy-bee. JOHN CORBETT, LINER NOTES .